Back in 1984 Ian Peck – now Northamptonshire’s vice-chair and one of the board members focusing on cricket policy – returned to the captaincy of Cambridge University in unusual circumstances. The appointed skipper Angus Pollock was told he needed to concentrate on his studies before exams. So Peck, who had left the university three years earlier, agreed to fill in for the first few matches. David Gower’s Leicestershire arrived at Fenner’s in mid-April and took no prisoners. Four of their batsmen – Chris Balderstone, Peter Willey (on his Foxes debut after leaving Northamptonshire the previous year), Ian Butcher and future TV commentator Mike Haysman – helped themselves to centuries, while a certain Jonathan Agnew bagged an ‘eight-for’ in the Light Blues’ first innings. Set a mere 588 to win, Peck’s band of plucky triers slumped to 65 all out. Leicestershire won by 522 runs. Thanks for the game, chaps. Opening the batting for Cambridge was Rob Andrew. This begs the question, which was the more futile sporting task – trying to keep Gower and company at bay, or attempting to stop Jonah Lomu in Cape Town a few years later? 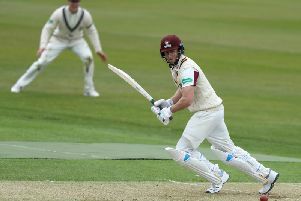 At any rate, Peck can empathise with the present-day MCCU teams as they feel the full weight of practice-hungry pros’ bats. “I know from experience that big losses are nothing new!” he told me as Durham’s students played at the County Ground earlier this week. “I think their role is still important. Cricketers mature at different stages and for some it’s better to go to university for three years – with the opportunity there to play against professionals – before moving on to a county staff. “The problem the universities have is that the academic bar keeps moving higher and higher. So admitting people who are outstanding games players but may not get the top A-Level results is very difficult for them. “They’re between a rock and a hard place, really. “From a cricketing point of view I think it’s dangerous and one-dimensional to have young players only coming through county academies. Another source must be beneficial. “The argument about retaining first-class status is a slightly different one. Peck appeared in the Cambridge side for four seasons between 1978 and 1981 – winning Blues against Oxford in the last two – and his career there overlapped with the likes of Paul Parker, Ian Greig and Derek Pringle, all future England cricketers, as well as Robin Boyd-Moss who remains a favourite batsman of many Northamptonshire supporters of my vintage. Even with such talented players on board it was still hard work for the university teams (just the two then as opposed to the six today) against first-class counties. “We thought the greatest compliment we could pay ourselves was to have a proper game of cricket against them, with the result in doubt at lunchtime on the third day. “That didn’t happen very often to be honest but it’s what we aspired to. And in 1981 we actually made Warwickshire follow on! “As far as the pros were concerned – different counties approached our matches in different ways. “At this time of year they just wanted their bowlers to bowl and their batsman to have plenty of time at the crease. If that meant they batted on a bit then fair enough. “You probably wouldn’t get the overseas pros opening the bowling – so if you played Middlesex it wouldn’t be Wayne Daniel and Vincent Van Der Bijl with the new ball, it would be Mike Selvey and someone else. “As the season went on and counties had some cricket under their belts you would tend to see lads coming back from injury and those struggling for form, and perhaps some from the second team. It’s also worth recalling that some top-liners – like Wayne Larkins – batted the same way whether facing an undergraduate trundler or Malcolm Marshall. “Ned played against us in 1980. We had an opening bowler named Mike Howat who was last man out in our first innings to a brand new ball. In his County capacity, Peck is optimistic the squad can make some progress in 2019 following the disappointments of last summer. “They’ve done a good deal of soul-searching in the dressing room and set themselves rules and standards about what they want to do,” he explains. “I just think it keeps getting harder. Every year players around the circuit add a little bit to their game and you have to stay with it. “I think our group has recognised this and they’re determined to do just that. “The recruitment has been good. Contracts come to an end, various people have left or retired and that gives a lot more flexibility in the budget. “Temba Bavuma is there to give us some structure in the middle-order. Jason Holder will be important from a leadership and management perspective – and we still have another T20 place to fill. “We have a very talented seam attack and we just need to occupy the crease in the Championship. “If we do that and set totals we could do well. “You can see how well our batsmen play in white-ball cricket. It’s a question of whether they can apply themselves in the longer game.